Research on abnormal human hemoglobins (protein in blood that carries oxygen), has taught us about the inheritance, biochemistry, and distribution of these traits. This knowledge, coupled with mathematical research using computer models of population genetics, has enabled researchers to marry biological fact and genetic theory. This volume places medical understanding in an evolutionary framework. 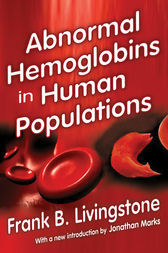 Using published data on the frequencies of abnormal hemoglobins in the world's populations, Livingston analyzes and interprets these frequencies in the light of world distribution of different forms of diseases such as malaria. He further develops the genetic theory of the evolutionary homeostasis. Livingston discusses the relation of abnormal hemoglobins to endemic malaria and, shows how natural selection pressures explain the known distribution of these traits. Where non-coinciding distributions arise, the book presents other genetic, anthropological, evolutionary, and epidemiological evidence to explain these discrepancies. This classic work remains a useful sourcebook for professors and graduate students of anthropology, genetics, epidemiology, and hematology.